The Multimedia view displays all photos, videos and files linked with your family tree. Files can be grouped, filtered and sorted using different viewing modes to help you quickly find the files you need. You can edit file properties, tag items to files, print and preview files directly from My Family Tree. Fig 1. The Multimedia view. 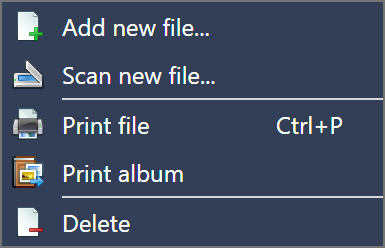 New files can be added by dropping them into the file panel or by using the File menu or right click menu over the file panel. You can also scan files directly into the application. 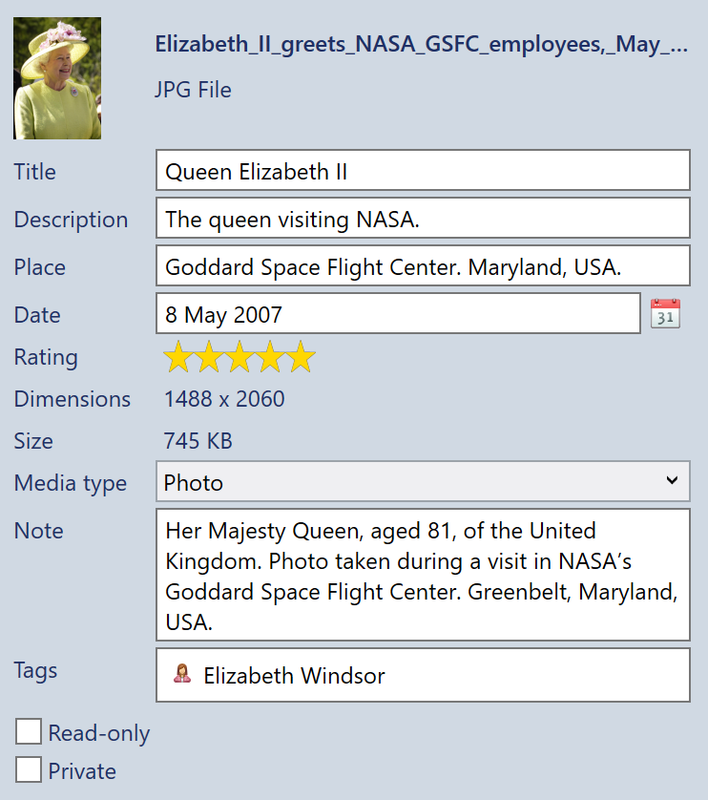 If you imported a GEDCOM file or a database from another application, there may be place holder files in present in the view. Place holder files represent files which could not be located during the original import. 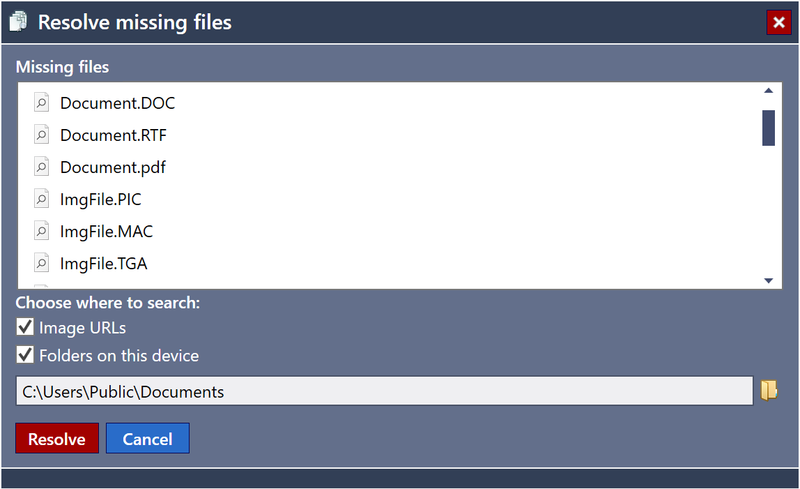 You can use the 'Resolve missing file...' or 'Resolve missing files...' tools to search for these missing files. The resolve tool allows you to download images at URLs, and also scans a chosen folder for the missing files. For best performance, it is best to try to collect any missing files into a contained folder. If you choose to search the whole disk, this will take time and increases the chance of duplicate file names being found. Fig 2. Resolving missing files. Files can be printed directly from My Family Tree if an application on your computer is capable of loading and printing the file. Images can also be printed as an album. Fig 3. Adding and printing files. You can add information describing each file in the file properties box. You can record the title, description, place and date associated with the file. For some files, some information will already be specified in the file metadata for example the date taken. For other files such as scanned documents, you may need to set this manually. Files can be tagged to other items in your tree. For example, a birth certificate could be attached to a citation about a person's birth date. To add a tag or remove tags, use the file properties editor. Click to add the first tag or right click the tag list box to add or remove a tag. Fig 5. Adding a tag. 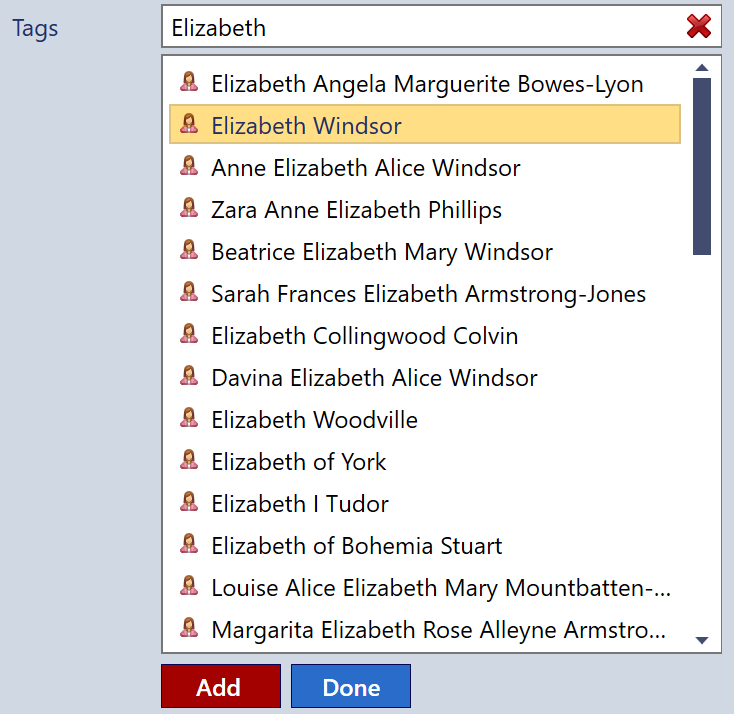 You can select the tags to add from a list of taggable items in your family tree. To add more than one tag at a time, select multiple tags from the list. Fig 6. Selecting taggable items. You can apply a wide range of effects using the image editor toolbar. Images are edited in place and all changes can be undone. Fig 7. Image editor toolbar. You can enable or disable the toolbar from the View menu. Images, videos and basic text documents can be previewed directly in the preview panel. Double click on any file to load it in the default application on your computer. Images can be viewed full screen in an image slideshow. During a slideshow, press the to toggle the photo information and and to move between photos. You can also left click to go forwards and right click to go backwards. Press to exit the slide show. Images can also be viewed in touch screen mode, simulating a pile of photographs on a desk. You can rotate, zoom or flick away images from the screen using standard touch gestures on supported devices. Video and audio files can be previewed in the media player. The controls are simple to use (Figure 8). Toggle for play and pause. Click the progress bar to move the position of the video and audio. Use the slider for volume level and toggle for mute. 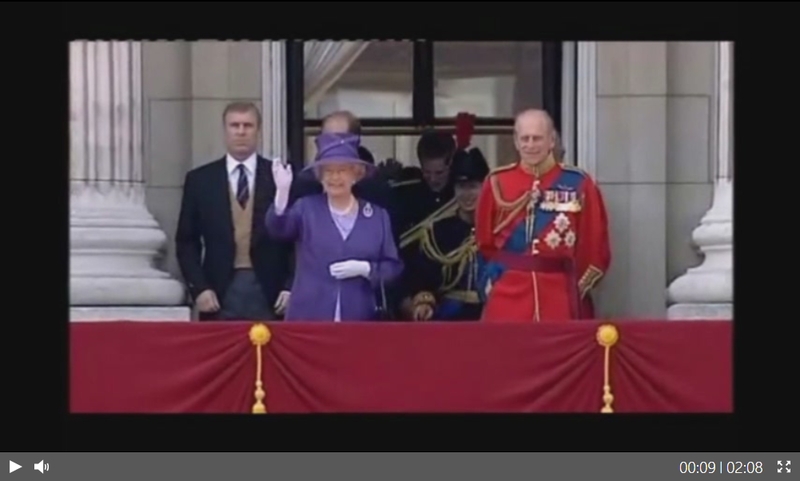 Video and audio can also be viewed in full screen mode. Fig 9. The Video and Audio view. 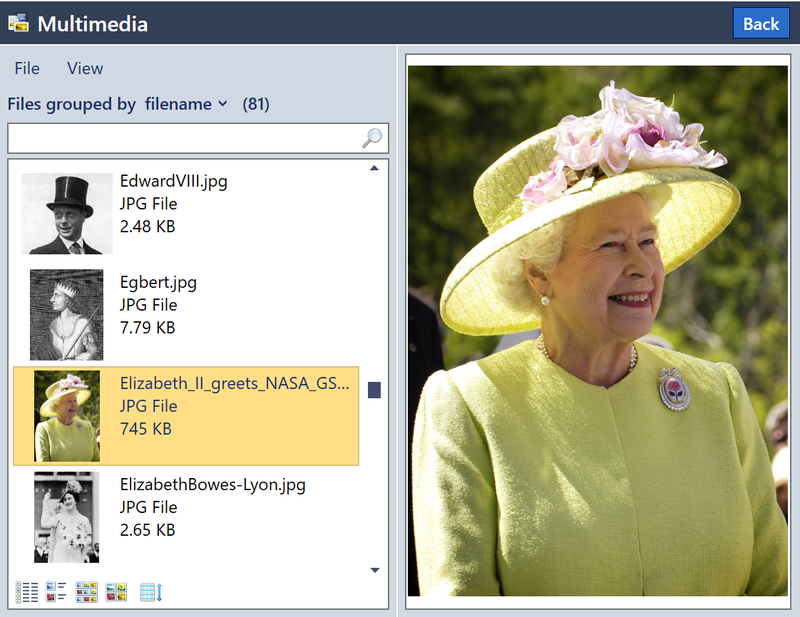 Text files, GEDCOM files, rich text files, PDF files, and XPS files can be previewed directly in the application. If you have a supported and appropriately licensed version of Microsoft Office installed on your computer, valid *.docx, *.odt, *.xlsx, *.ods and *.csv files can also be previewed.